» How Full Is YOUR Bucket? Students love participating in the ‘bucket’ activity because they have a tangible way of tracking their personal success and achievement with character building, while also gaining a gentle reminder of where they could make alterations in their lives. They can engage in a little friendly competition with themselves and others and have fun while growing on a personal level. By participating in this activity, students are not only tracking their own behavior and actions (thus becoming less teacher directed), they are also inadvertently increasing their awareness. The more awareness that occurs, the easier it becomes to focus and direct thoughts and actions for good. Student awareness will increase through these activities. Associations will begin to be made between words and actions and the image of a full or empty bucket. 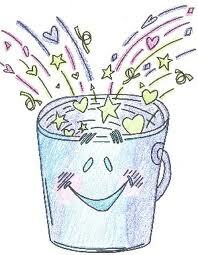 Hopefully each time students interact in the future, they will think about their own and others’ buckets first. TRY IT! Then tell me if you wish your teacher had taught it! 1. 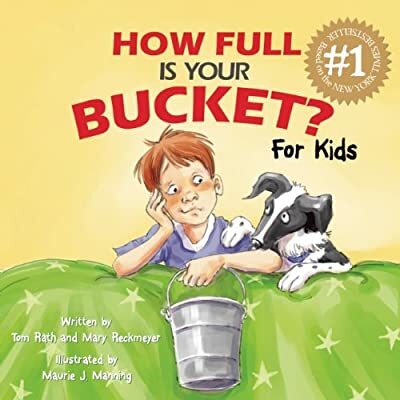 Introduce this activity by reading the book: How Full Is Your Bucket? For Kids By: Tom Rath and Mary Reckmeyer. 2. Reinforce the lesson that all people have an invisible bucket that is both taken from and filled back up on a daily basis. Have the students imagine what their invisible buckets might look like and how full or empty they believe them to be and why. 3. Provide each student with their very own personal bucket (purchase small buckets from a dollar store, or, just use plastic cups). 4. Fill the buckets with something meaningful to the students. The possible items can be brainstormed together (i.e. : marbles, coins, little heart-shaped trinkets, candies etc.). 6. Students are to use these buckets each day, not to empty based on what others take from them, rather, based on what they take from others through their words and actions. 7. Students are to monitor their actions, behavior, intent, and words by removing a trinket from their bucket when they notice that they have ‘dipped into’ someone else’s. For example: if they say something unkind to someone at recess, or forget to share, they may recognize this as a way they have taken from another person’s bucket. They would take one item out of their bucket and leave it aside. Alternately, if someone has appreciated the kind gestures of another, they may add a trinket to that person’s bucket for them. 8. A little friendly competition may occur as students begin to pay attention to their classmates’ buckets; this may encourage further effort. 9. At the end of each day, students can count up the number of items in their bucket and reflect on their day. They can set a goal for the following day based on these results. A) Students can graph their results over a week or a month and analyze the results. B) Students can write reflections or goals each day and discuss the feelings associated with having a full or empty bucket. They might extend their use of the bucket into the home and compare its fullness to school and why. C) An extra challenging extension is to have students remove from their bucket whenever they catch themselves having a negative thought. When a negative thought arises, a student must remove an item from the bucket and also replace that thought with a more positive one. Thoughts are SO powerful and the more aware we are of them, the more we can change them and live our best lives! D) If this activity is only going to be practiced for one day, it can be altered. Try giving each student a heart cut-out instead of a bucket. Each time they have felt that they have been taken from, (instead of when they take from others) they can rip a small part of the paper heart away. This is a powerful visual for students to see the way their words and actions are affecting others. If you like this lesson plan, please see the Warm Up section for more extensions. I’m glad that you won’t be arguing! Lol. It’s great to hear that this is coming to you in a new way. Thanks for the feedback! I do appreciate your gratitude. Thank you for the feedback! This posatively answered my downside, thanks! I conceive this web site contains some real superb information for everyone. “He is able who thinks he is able.” by Buddha. Thanks so much for your wonderful comment. Profound quote…thanks for sharing! Everything is very open with a clear explanation of the issues. It was really informative. Your website is extremely helpful. Many thanks for sharing! Wow, that itself is a special comment. Thank you. 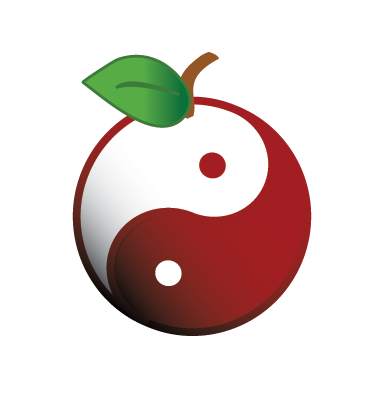 I’m so truly grateful for the time everyone has taken to share their feedback and responses to New Age Teacher. The thanks must really go to you for this beautiful comment. I’m so glad that you will be following along and I look forward to any other feedback you have! Thanks. I’m typically to running a blog and i really admire your content. The article has really peaks my interest. I’m going to bookmark your website and maintain checking for new information. Thanks for the support and sharing – every bit helps! Hi there, I discovered your site by way of Google while searching for a comparable matter, your website came up, it seems good. I have bookmarked it in my google bookmarks. Good post. I learn something new and challenging on sites I stumbleupon on a daily basis. It will always be helpful to read articles from other authors and use a little something from their sites. Great to know that this has offered you something worthwhile. Come back soon and all the best. I agree with you and will be definately looking forward to your future updates. Thank you and keep the great work up. I simply want to say I’m newbie to weblog and absolutely loved you’re blog site. Most likely I’m planning to bookmark your blog post . You absolutely have fantastic writings. Kudos for revealing your blog. thank for dropping this story. I am definitely tired of struggling to uncover relevant and intelligent commentary on this subject. Everyone currently seem to go to extremes to either drive home their viewpoint or suggest that everybody else in the globe is wrong. thank for your concise and relevant insight. I’m happy that you’re comfortable with the ideas that have been presented. I am always open to opposing or different views. It’s simply important that we have a positive dialogue going to further create awareness and understanding of this world we live in. Thanks for the valuable feedback! Hola! I’m amazed with your Blog, and found that it is really informative. Is this a paid theme or did you modify it yourself? It’s rare to see such a nice blog like this one these days… Cheers. Great! Glad you’re happy. Please let me know if there’s any more information you’re interested in! Bonjour! Thanks for the great info. I don’t often get to read different poeple’s feedback, much less take part. Because it’s Friday, I have some spare time – I always learn something. Thank you. I’m certainly glad you had a little extra time on this particular Friday…thanks for taking that spare time to get involved in our conversations! Very good article. I unquestionably love this particular website. Keep writing! My brother recommended I might like this blog. He was totally right. This put up truly made my day. You can not consider simply how so much time I had spent for this info! Thank you! Please do as I plan to continue for some time! Thanks. Which are your favourites? I love those perfect finds! Hi – I would like to say thanks for an interesting site about a subject I have had an interest in for a long time now. I have been lurking and reading the comments avidly so just wanted to express my gratitude for providing me with some very good reading material. I look forward to more, and taking a more proactive part in the discussions here, whilst picking up some knowledge too!! You can certainly see your expertise within the work you write. The arena hopes for even more passionate writers like you who aren’t afraid to say how they believe. At all times follow your heart. hey nice blog! i hope you keep us updated! This website has got some extremely useful information on it. Thanks for sharing it with me! Thanks for sharing with others and continuing to support the site. I look forward to your future visits.